Andy Hodge, Alex Partridge, Peter Reed and Steve Williams have won Great Britain's first world championships gold in the men's four in Japan. 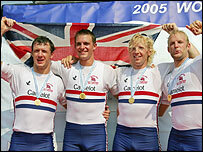 In oppressive heat, they beat the Dutch and Canadians to win the coxless four in a time of six minutes 11.59 secs. "We decided to row how we have for the last three months and dominate from the start," Partridge told Radio Five Live. "We took a second out of the second boat in the third 500m, and from there we walked away - game over." Partridge was forced to withdraw from the four which went on to win the Olympic gold medal after suffering a collapsed lung, and said he hoped Saturday's triumph was the first step towards success in Beijing in 2008. "One of the things I said to the guys at the start was: 'This is the beginning.' That's hypothetical as we have to perform individually through the winter, but in our minds, this is the beginning of the build up for the next four years," he said. "We want to set the standard for the next two world championships and Beijing. "It's difficult in this heat - even with a little breeze, it's really hot. It feels like your lungs want to pop out of your chest." Earlier Britain's Zac Purchase won silver in the lightweight single scull. He finished more than five seconds behind gold-medal winner Vasileios Polymeros of Greece and less than a second ahead of Fabrice Moreau. "It was simply unbelievable", said Purchase. "It might not feel like it in the first minute or two when the pain kicks in, but now it feels great. Jo Hammond was another early British finalist on Saturday. She came within a second of a medal in the women's lightweight sculls but had to make do with fourth place.